But for a low-profile, high-powered CEO like Moonves, there isn’t much incentive for CBS to do the right thing:Advertisers aren’t pulling money from the network, and earnings have been great. Perhaps the most disturbing part of the accusations — one that has gotten somewhat lost in the discussion — is that six women who said they shot down Moonves’ advances described some form of retaliation. “What happened to me was a sexual assault, and then I was fired for not participating,” actress Illeana Douglas told The New Yorker’s Ronan Farrow . “The revenge behavior, the ‘I’ll get you for not kissing me, I’ll get you for not doing what the hell I want you to do’ — it never quite leaves you,” she said. CBS’s stock dipped the day Farrow’s story surfaced, but it isrecovering with the Thursday earnings beat . Advertisers have not seemed to pull money from the network . As Business Insider’s Mike Shields reported, it’s a lot easier to move money from one controversial show to another than to remove it from an entire network. 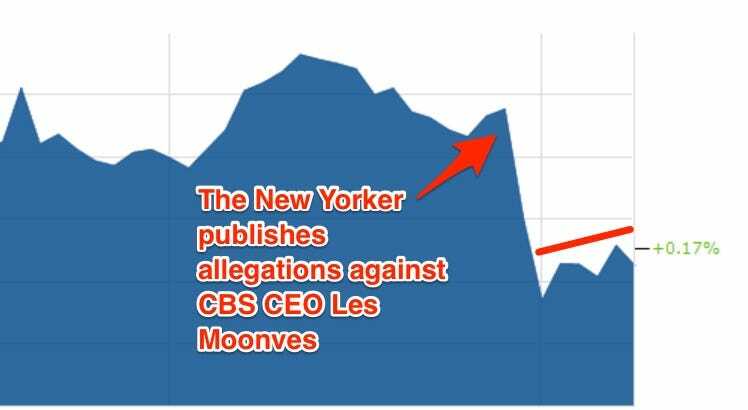 There’s no public outcry holding CBS accountable either — most people probably don’t know who Moonves is — unlike Matt Lauer or Charlie Rose, who were fired by their networks within about 24 hours of sexual-misconduct allegations surfacing. Even advocacy group Sleeping Giants , which puts pressure on advertisers to pull support from content it deems offensive, has yet to take aim at CBS.